Betway are a bit like that difficult uncle you see each Christmas, if you will run with the analogy; he can be cantankerous and obstinate, but once he has had a few drinks he is great for a laugh. So then, Betway give absolutely nothing away unless you sign up first – you can’t even see the interface – but once you are in, you get a glimpse of just how good the Casino can be. Exclusively a Microgaming site and powered by Microgaming software, this might not be the place for you if diversity is what you are looking for; but if you are happy with a single, and arguably the best, software provider then Betway is a real gem. Slot heavy as you would expect, they are also good for Video Poker and Retro slots, while the Live Casino is powered by Evolution so you know you are in for a good time. What’s more, the whole library is instant play so there is nothing to download, and most games are available to demo as well. Betway have been on a sponsorship spree since 2014, which has seen the company’s reputation grow to the point that they are now mentioned in the same breath as some of the biggest in the business, which is no mean feat in such a competitive industry. Register, opt in and deposit (PayPal or Credit/Debit card) £20+ and get 100% matched bonus up to £250, with additional bonuses of 25% up to £250 on second deposit and 50% up to £500 on third. Claim each bonus within 7 days of account opening. Wagering of 50x the bonus before withdrawing. T&C's Apply. New Customers (18+) Only. Begambleaware.org. 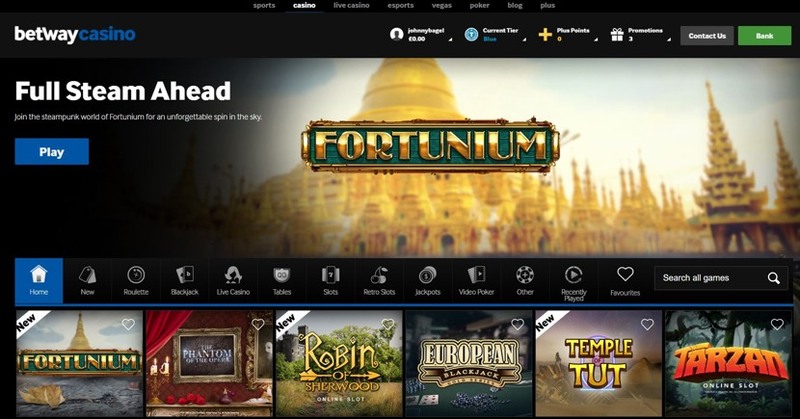 The website is split into 8 different sections, although there is a good deal of crossover between the Casino, Live Casino and Vegas sections. It feels unnecessarily complicated to us, but then again it saves a few clicks for those players who prefer specific types of games. Under the Casino heading you will find 12 categories plus a search bar if you know the game you are looking for. We hope you do, because scrolling through all of the titles under Slots could take a while; although you can create a favourites list to make things easier for next time. Once a game is open, a neat collapsible side bar allows you to continue browsing as you spin the reels too, which works well for multi-taskers. Slots – At more than 400 slots to plough through, even playing one a day all year would leave you with some work to do. If you like a bit of a storyline go for Immortal Romance or Thunderstruck 2, otherwise Deco Diamonds or Sugar Parade might be more to your taste. Jackpots – Not the biggest selection in the world, currently standing at 14, but we are talking Microgaming here, so Mega Moolah and Major Millions are among them and they offer eye watering sums. Retro – We wouldn’t usually mention this, but Betway have made an effort to assemble almost 80 Retro Slots. Sonic Boom and Astro Nomical really fit the brief. Blackjack – This is a Blackjack players paradise, with 27 variations on offer. You could do a world tour with Spanish, European and Vegas Blackjack, and they all come with Gold Series versions too. Roulette – Side-lined somewhat, just 8 roulette games can be played, with Premiere Roulette being a good option if you’re feeling snooty, and Multi Wheel if you want to up the pace. Table Games – One of the 14 different games should satisfy your hankering for something different, with Red Dog, Craps and Progressive Cyberstud Poker for all you Cyber Studs. Live Dealer – Accessible from the Casino as well as the Live Casino tab, a wealth of Roulette and Blackjack tables await to suit all bank rolls, as well as Dreamcatcher and a few Poker variations, thanks to Evolution Gaming. Video Poker – You don’t often see a Video Poker collection topping 20 games, so get your game face on and take a seat. You can keep playing your favourite game while you are on the bus, on your lunch hour or on the skive (your secret’s safe) with Betway’s mobile optimised website or one of their apps. They have separate apps for the Sportsbook and the Casino but you can access one from the other so we can’t see why. 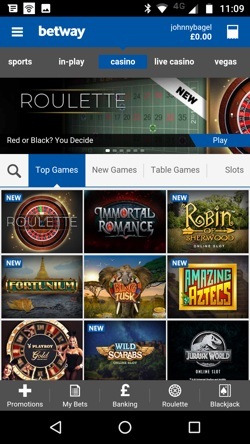 The mobile site and the casino app look identical in layout and design but have a different feel to the desktop site in that the dramatic black background has been replaced with a white one, making it feel brighter and lighter. There are fewer categories listed, understandably since there are 50% fewer games to choose from, but at more than 200 in total there is still plenty to keep you entertained; there isn’t the option of free play via mobile, though. Both are great products, responsive to the touch and moving quickly between selections once the initial page load has been completed. This can take a little longer than we would like when using the app but the games load at a reasonable lick, and the site doesn’t suffer graphically. There are also useful quick links to Banking and Promotions. A successful job all round we would say. There are limited options when thinking about payments, but the positives are that there don’t seem to be any upper limits for deposits or withdrawals – although you can easily self-regulate if you wish. As the flagship brand of The Betway Group, Betway started life back in 2006 and has grown to become one of the best known online gambling brands in Europe, available in the UK, Germany, Italy, Spain and Belgium to name just a few. After years of steady growth, the company really put the pedal to the metal in 2014 when they set of on a rampage of sponsorship deals with football clubs and sporting events all over Europe that has continued to this day. 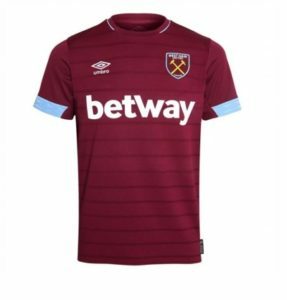 One of the most notable saw them become the official partners of West Ham Utd, no doubt buying them the loyalty of some of the most dedicated football fans in the country. They have also employed the services of several sporting greats as ambassadors; namely Simon Hughes, Richard Johnson, Mike Tindall and Davy Russell. In the middle of all of this sponsoring madness, a stroke of luck saw a record breaking Jackpot win for one of Betway’s players which brought further attention to the company, and from a different angle too. While playing Mega Moolah one Jon Heywood won a stonking £13.2 million, making headlines in the online casino world. He is an ex-serviceman too, so good luck to him. The company is based in Malta and Guernsey (surprise, surprise) but also has offices in London, Cape Town and the Isle of Man. Betway are on shaky ground here. On paper everything looks fantastic: 24/7 Live Chat and Email plus a freephone support option and dedicated Twitter account; however, getting the details for them is tiresome, since the Contact Us button takes you to a rather frustrating FAQ which is akin to a lucky dip as to whether or not you find the info you are looking for. Some of the articles have a link to the Contact Us page, luckily, which will finally get you to the right place. Once you find Live Chat you will connect quickly but will also have to annoyingly confirm a bunch of details for some unknown reason – hardly any other casino’s make you jump through these hoops – but at least the team are polite and helpful once you get down to business. 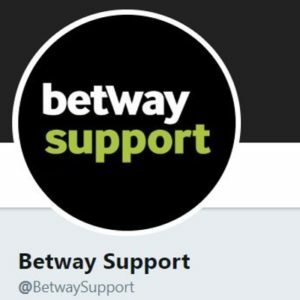 Betway and their sister sites have been criticised in the past for ignoring player complaints and being slow off the mark to deal with suspect affiliates, but we have to say that from our research we have found them active daily and keen to settle disputes online, so it seems like they have pulled their socks up. Live Chat – We found it by searching ‘Help’ in the FAQ which then gave us an article with a link to the Contact Us page where we were finally able to start Live Chat. What a palava! Email – Use Support@betway.com but just be aware that they might take a day or so to reply. Phone – 0808 238 9841 is the number to call 24/7, and it’s free. @Betwaysupport – As the name suggests this account is dedicated to customer support and is active 8am – 11pm. Big tick for Betway.